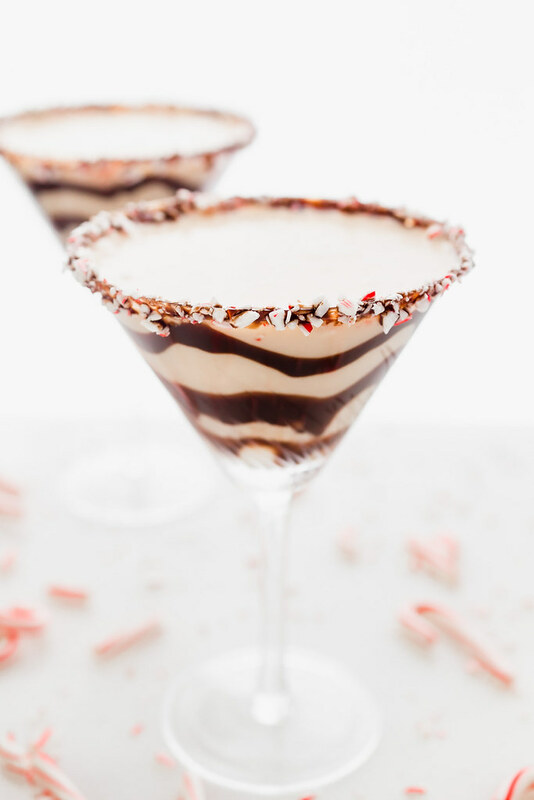 The Peppermint Mochatini: A boozy peppermint, coffee, and chocolate flavored dessert cocktail that’s as easy to make as it is to drink. ‘Tis the season! Deep into the holiday season now, I’ve got peppermint candies dancing in my head. OK, maybe that’s a little bit of a stretch buuuut I do love me some peppermint this time of year. How could anyone not? What seems like a decade ago – or maybe it actually was almost a decade now – I made a batch of peppermint brownies. They were fudgy, rich, and topped with chopped candy cane kisses. Then a few years after that, I made hot chocolate cookies topped with homemade peppermint marshmallows. UMMMM HELLO!! THEN a few years after that – I know, when will I stop with this?? – I made peppermint pretzel marshmallow fudge. Oh holy night!! Do you see where I’m going here? That combination of chocolate and peppermint is a crazy huge winner in my book!! I guess it helps that when you’ve been blogging for almost 12 years, you have a great assortment of favorites to choose from. But I digress. Let’s get to this cocktail. The Peppermint Mochatini. Sounds delightful and so so Christmasy, doesn’t it?? Well hold onto your Santa hats, friends! Loaded up with 2 kinds of vodka (plain and peppermint) and peppermint Khalua, the booze is shaken with heavy cream to give you a rich and creamy concoction. 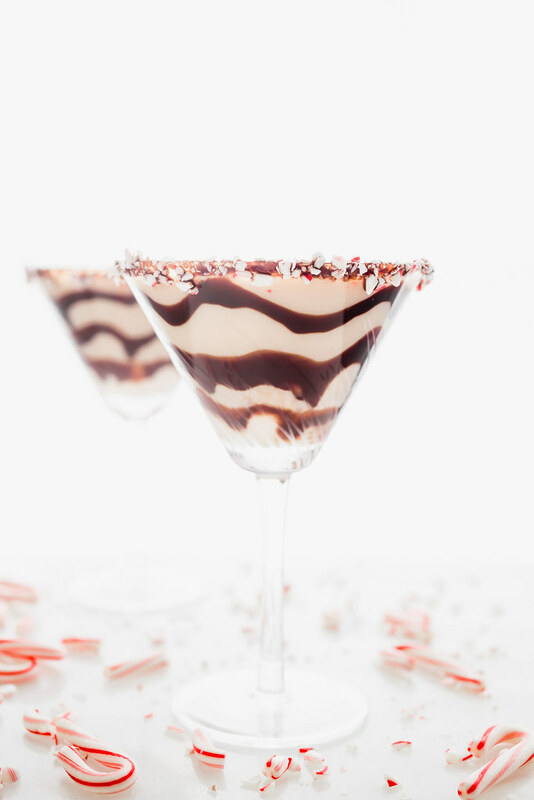 To pretty the cocktail up to the next level, you’ll dip the rim of the glasses in some chocolate syrup and then crushed candy canes. YES!!! A candy cane rim!! AND THEN! 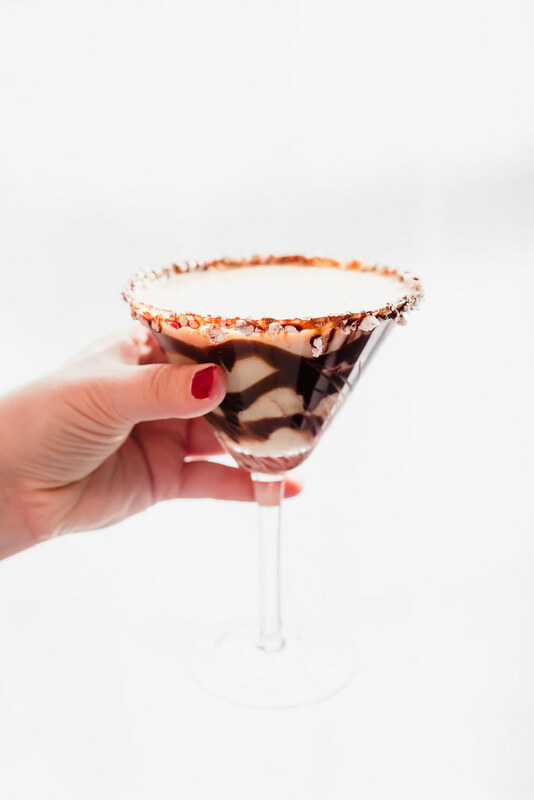 You’ll swirl some more of that chocolate syrup around the inside of the glass and quickly pour the drink in to preserve that pretty swirl before serving. The “mocha” part of this cocktail comes when the chocolate syrup from the glass’s rim and swirl mingle with the coffee-flavored Khalua in the drink. It’s the perfect combination! 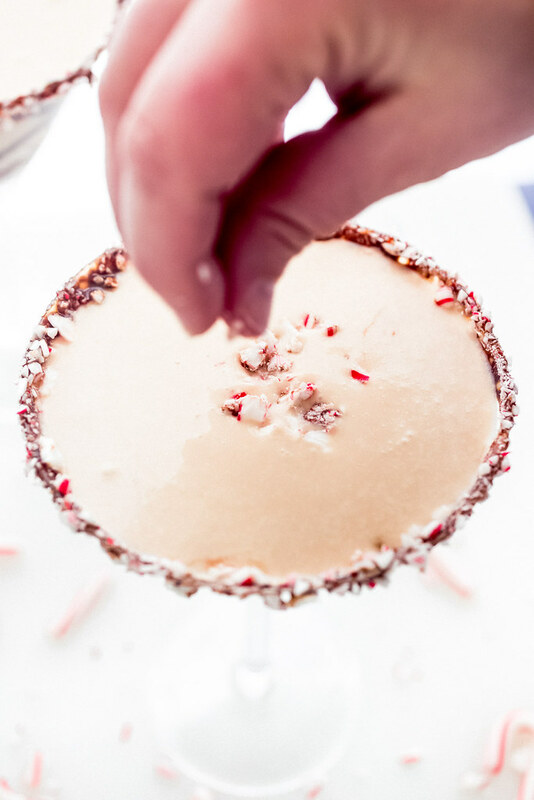 The Peppermint Mochatini is a crazy delicious cocktail that would be just lovely served at a cookie swap or on the dessert table of your next holiday party. You know, right next to those peppermint brownies that are now dancing in YOUR head! And speaking of your next holiday party, let me point you in the direction of an excellent list of 38 treats for your holiday packages and platters. It’s a little something I compiled yes, a few years ago, with a whole slew of our favorite holiday treats. Enjoy! Be sure to keep your chocolate syrup cold in order to achieve those pretty swirls around the inside of the glass. Drizzle a puddle of the chocolate syrup on a small-ish plate (dessert plate size is fine). Spread the crushed candy canes/peppermints in an even layer on another small-ish plate. Set both aside for while you mix the drink. Shake all of the liquor and the heavy cream in shaker with ice. Stick the shaker in the fridge while you garnish the glasses. 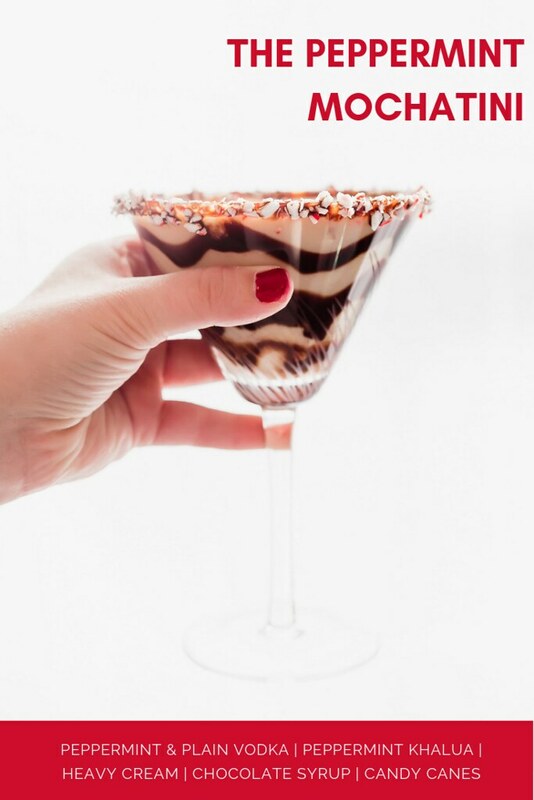 Turn a martini glass upside and dip the rim into the chocolate syrup, all the way around. You’ll want a good coating for the crushed candies to stick to. Move the upside down glass to the second plate and set it down in the crushed candies. Ease the candies onto the chocolate on the inner and outer rim of the glass, pressing lightly as you go to help them stick. Repeat with the remaining glasses. Note: It will help to keep the finished glasses in the fridge on a platter so the chocolate stays cold to help prevent the candies from running down the glass. 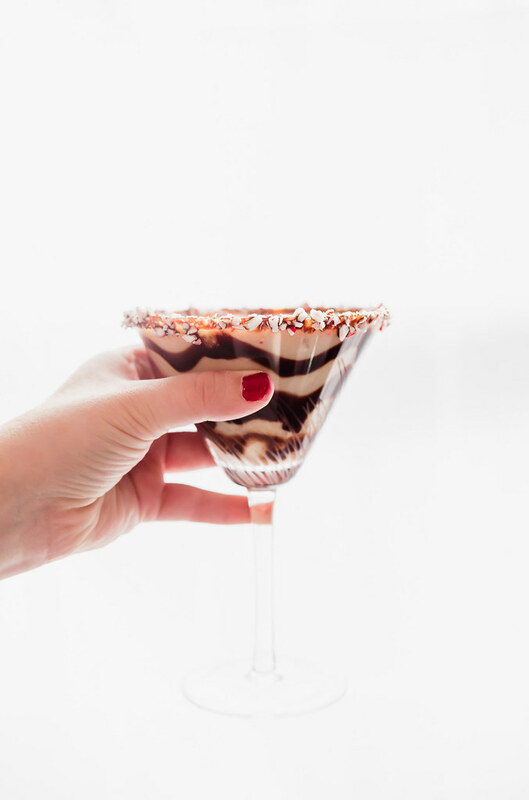 Once all of the glasses are garnished, drizzle a swirl of chocolate syrup into each of the glasses starting from the bottom and working your way out to the edge of the glass. A trick to help do this neatly is to hold the syrup bottle in one place and slowly spin the stem of the glass in your fingers as you squeeze the syrup into the swirly pattern in the glass. Once you’ve swirled the syrup into all of the glasses, give the drink mix another quick shake and quickly strain it into the garnished martini glasses. Pouring straight into the bottom of the glasses, rather than down the sides, will keep the chocolate syrup in place. Sprinkle some extra crushed candies into the center of the drink or hang a small candy cane off the side of the glass if you wish before serving.